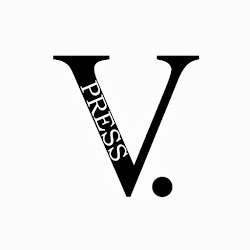 While the V. Press blog has been quiet, we've been very busy behind the scenes: reading submissions, making decisions about our first solo poet pamphlets and planning a few other surprises for next year. We were absolutely delighted with the poems received in our first open submissions window. The joy of reading was only tempered slightly by how hard this made the final decisions. In the end, we asked to see the full pamphlets by four poets. We are delighted to have offered publication to one poet and hope to launch this very, very exciting pamphlet in the spring. More details of this will follow soon, along hopefully with some other publications news. It's the first day of advent and, if you're looking for a small poetic something to offer the one you love, laugh with or lust after, then the V. Press pamphlet anthology The Vaginellas may be just the thing. We have a few copies of this delicious concoction of fun left in the bookshop post the poets' Ledbury Poetry Festival gig. At just £5, we hope you'll find it very, very tempting! Early/not-so-early festive greetings from V. Press.